Jim will cover this in detail today, but here is the video of the school kids singing praises to President Obama. I’m wondering if they are allowed to recite the Pledge of Allegiance each morning? UPDATE: Malkin has much more including the name of the school which looks to be B. Bernice Young Elementary School in Burlington Township, New Jersey. Go read Michelle’s post! UPDATE 2 At bottom of post. Michelle Malkin was right. It wasn’t about the speech Obama delivered to the kiddies. It’s what overzealous Obamabot teachers would turn it into. I still haven’t found the origin of the video … but its creepy enough on its own. I have added for extra special impact … the kids who sang in California last September. Yummy. Could you imagine the uproar of kids were singing praise to Bush (43) or Reagan? For the record, I’d feel very uncomfortable and would have the same feelings if these kids were singing praises to Bush or Reagan. Even creepier … how’s this lesson plan via Michelle’s website, and here is the original full report over at Smart Girl Nation – a must read since it has the rest of the study guide. Others blogging… Sister Toldjah and Gateway Pundit. Update 2 (Jim) Indeed, Steve is right. You should go to Michelle’s site for updates of which there are many including a response from the school district that will I hope, outrage you. But, in the meantime I have added two more videos to the post. Erik posited whether this might be one rogue teacher. Unfortunately it’s not. And given the NEA’s position on Obama my guess is there are many more. Here’s one. And if that doesn’t creep you out … maybe this will. It’s the line from Michael York at the end that makes the point the best. More Obama administration threats - Networks. Must. Drink. Kool Aid. What is next, the re-education camps? Imprisonment for speaking out agaisnt the President and the Goverment? I hope that the President does not see this…he really does not need any more ideas………………… I wurry I am really Wurried…………. Stuff like this WORRY me. A poster to Malkin's site also linked to a nice little YouTube creation that showed disturbingly identical singing children tributes to Dear Leader, Lenin and Hitler. Question of the day: If it looks like a duck, and quacks like a duck, how long before it is goosestepping? "how’s this lesson plan via Michelle’s website, and here is the original full report over at Smart Girl Nation — a must read since it has the rest of the study guide." That statement is totally untrue. First there is not a lesson plan posted anywhere on either of those posts. 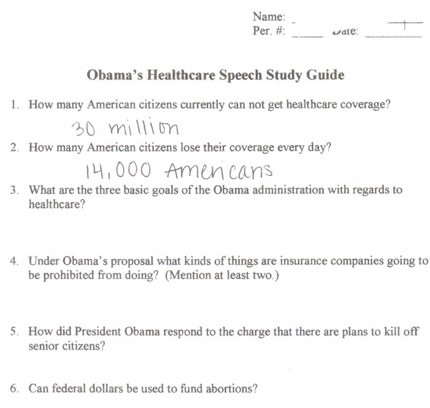 There was a teacher that had the kids watch the healthcare speech and then gave them a quiz on it. Second you mention the "rest of the study guide" which I also can not find in either of those posts. @Erik … Call it a quiz or a study guide… whatever. At the time it was posted, it was not clear (honestly, I really did not think too much about it – sorry). As to if it was a take home assignment, quiz or study guide or whatever, I'm not sure it matters in the context of the issue at hand. Why did I tell people they needed to go read MM and SGN? Simple, that's what we do in the blog world. We give credit where credit is due and direct readers to our sources in thanks. Also, there were more questions (7 through 10) over at SGN that were not posted on MM. Sorry I wasted your time. To clarify, Jim and I were working on the same post at the same time yesterday morning. We finished at the same time. We combined them and I just listed Jim as the author. Jim mentioned the lines that are patterned after "Jesus Loves the Little Children". The second part sounds like it's to the tune of "Battle Hymn of the Republic"! In high school, we had a class called recent or modern history…where we would monitor recent events and discuss them in class. I don't see the big deal with the Study guide. Well gee…. maybe it’s because question 1 is a lie? Question 2 is probably a lie. … This quiz or whatever is clearly political indoctrination and you know it. Was there any discussion about the 30 million figure? Why did it change from 47 million just days before to 30 million that day? Maybe there is a difference between getting health care coverage (care) and getting health care insurance? These kids will think they will not be able to be treated at all and you know it. Never mind they want to ditch Health Savings Accounts that work well for many who are young and healthy, providing free annual checkups and tests, allows them to build up a tax-free account for medical expenses, and provides catastrophic coverage so they will not have to go into bankruptcy? Oh, those people are not paying enough into “the system” to cover the others who can’t pay so they will have to pay more! Never mind the small stuff huh? It is time for parents to start asking those who are members of BOE why is stuff like this going on in the schools and less of the needed subjects of English grammer/writing, science, math, and US history being taught. The hand that rocks the cradle is the hand that rules the world! I'm all for breaking up the National Education Association; why nationalize educational systems that are funded locally with your tax money? I remember being a sixth grade student thirty years ago- my teachers had us writing to Greenpeace, Sea Shepherd and all sorts of other crazy organizations; although, all of them were secular and safe for children- of course! Thank you Jim. Show people this video .. .http://www.youtube.com/watch?v=cdPSqL9_mfM…and some people get it. Others aggressively defend people like me are the serious problem for foamenting hysteria. I see it in my own house Jim. One of my 7 year old daughter's favorite games to play is dressing up as an old person to inspect my office with note pad in hand. She writes up how messy things are and how courteous I talk to her. She watches nothing on TV to pick this up Jim. I wonder and worry if she is getting this from school. If my innocent 7 year old daughter is being trained for a future career life as some nazi socialist spy of the brave new world shaking down whats left of business for fines and taxes…that her only hope of a job is being some government bureaucrat who makes a living harassing people. I worry Jim . The loss of freedom and opportunity my children face. I don't know about anyone else, but watching these videos I reminded of the "Schindler's List" scene, where they play the children's song to round them up and put them on the trucks and as they drove off with the children waving, the mothers watching with horror in their faces as they knew where they were going. This is what comes about when parents are not involved or when the only parents involved are the liberal ones. It gets better. Apparently they were singing some sort of Christian song but removed "Jesus Christ" and inserted "Barack Hussein Obama." The Baptists were quite right in urging their people to pull out of the public schools. Needless to say this is not being chanted in my kids' Catholic school.